A large crowd of Brooklynites, young and old, cheering and waving Israeli flags, gathered in Asser Levy Park in Brighton Beach on Wednesday night, Aug. 6 to show their support for Israel. The array of guest speakers included Assemblyman Steven Cymbrowitz; Malcolm Hoenlein, executive vice chairman of the Conference of Presidents of Major American Jewish Organizations; Michael Miller, CEO of JCRC-NY; Assemblyman Dov Hikind; IDF Brigadier General Ari Tesler; Andrew Gross, political advisor to the Deputy Consul General; Morton Klein, president of the Zionist Organization of America; Leonard Petlakh, executive director of the Kings Bay YM-YWHA; Assemblywoman Helene Weinstein; Rubin Margules, president of the Zionist Organization of America - Brooklyn region; and Eugene Shkolnikov, Russian-American philanthropist and board member of the Kings Bay Y. "What would America do if 80 percent of its citizens were forced to run into bomb shelters twice a day from rocket fire from Mexico or Canada?" "As so many around the world gather to condemn Israel's right to defend itself from terrorists, it is imperative that we all stand together to show our support for the people of Israel," Cymbrowitz said. "Israel uses painstaking restraint not to harm citizens. We finally need to tell the world: Enough." Rubin Margules, President of ZOA Brooklyn Region and chief organizer of the event, said, "We put this event together because it was important to show our support, to be counted and to stand together for the people of Israel," said Margules. Klein said, "What would America do if 80 percent of its citizens were forced to run into bomb shelters twice a day from rocket fire from Mexico or Canada? That's the situation in Israel where more than six million of the eight million Israelis are given 15 seconds to run into bomb shelters due to the 3,000 missiles launched by Hamas. The world now condemning Israel for Arab civilian deaths is a diplomatic Kristallnacht." Malcolm Hoenlein of the Conference of Presidents said, "Hamas exists to kill. Israel,sometimes has to kill to exist," said Hoenlein. ""Thank G-d there are no sirens going off on 5th Avenue or 13th Avenue. Americans don't know what it's like to run for cover," said Hikind. A line-up of internationally known Israeli musicians performed free of charge. They had the crowd singing along to favorites like "Yerushalayim Shel Zahav (Jerusalem of Gold)" and swaying along to "Blowin' in the Wind." The performers included Galit Burg Michael, Benny Elbaz, Sandy Shmuely, Ron Eliran and Gershon Veroba. Throughout the evening the crowd expressed its support with frequent shouts of "Am Yisrael Chai (The People of Israel Live!)." 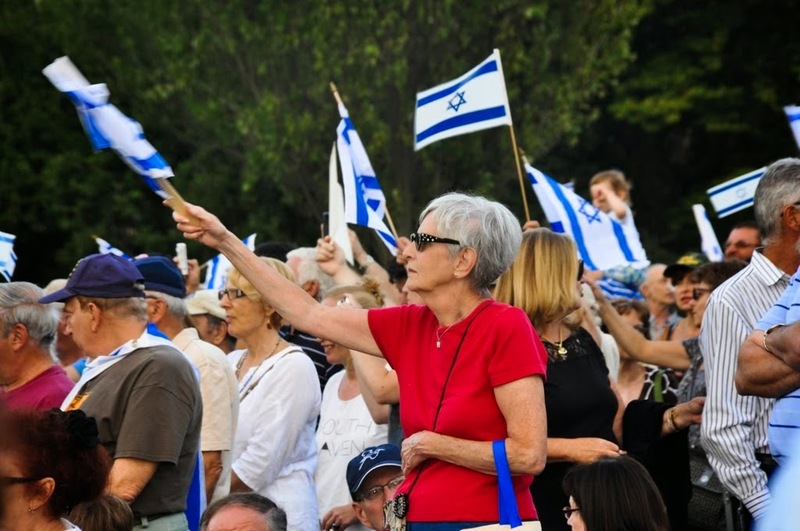 At the end of the night, with the moon shining as bright as the crowd's spirits, community and Jewish leaders danced the Hora onstage and led everyone in "Hatikvah (The Hope)," Israel's national anthem. The event was sponsored by Cymbrowitz, the Zionist Organization of America, RAJE, DaNu Radio, American Forum of Russian-Speaking Jewry, Kings Bay Y, the Jewish Community Relations Council of New York, JCH of Bensonhurst, Shorefront JCC, Hadassah, Emunah, One Israel Fund, Jewish Press, JCC of Canarsie, Jerusalem Chai, Coalition for Israel, Simon Wiesenthal Center and COJO of Bensonhurst.